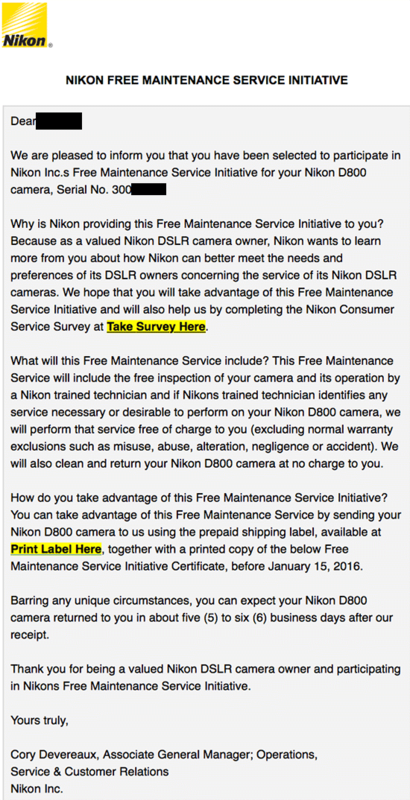 Today Nikon sent out letters to selected D800 camera owners to participate in a free "Nikon Maintenance Service Initiative". 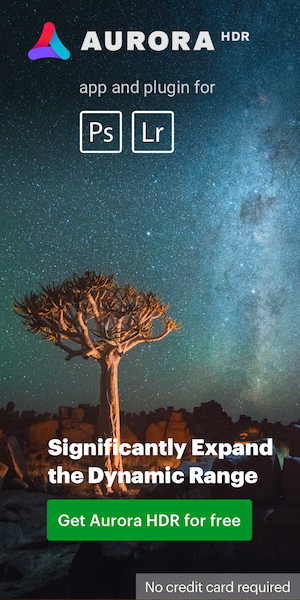 I am not sure if this is just another phrase for a recall or Nikon simply wants to test a large number of D800 units in order to determine if a certain issue is present. My guess is that this has to do with the D800 left focus issue. This offer is valid till 1/15/2016. Coincidentally, refurbished Nikon D800 cameras reached a new low price today: $1,649.00. Update: similar emails were also sent to D700 camera owners. We are pleased to inform you that you have been selected to participate in Nikon Inc.s Free Maintenance Service Initiative for your Nikon D800 camera, Serial No. 300xxxx. Why is Nikon providing this Free Maintenance Service Initiative to you? Because as a valued Nikon DSLR camera owner, Nikon wants to learn more from you about how Nikon can better meet the needs and preferences of its DSLR owners concerning the service of its Nikon DSLR cameras. We hope that you will take advantage of this Free Maintenance Service Initiative and will also help us by completing the Nikon Consumer Service Survey at Take Survey Here. What will this Free Maintenance Service include? This Free Maintenance Service will include the free inspection of your camera and its operation by a Nikon trained technician and if Nikons trained technician identifies any service necessary or desirable to perform on your Nikon D800 camera, we will perform that service free of charge to you (excluding normal warranty exclusions such as misuse, abuse, alteration, negligence or accident). We will also clean and return your Nikon D800 camera at no charge to you. How do you take advantage of this Free Maintenance Service Initiative? You can take advantage of this Free Maintenance Service by sending your Nikon D800 camera to us using the prepaid shipping label, available at Print Label Here, together with a printed copy of the below Free Maintenance Service Initiative Certificate, before January 15, 2016. Barring any unique circumstances, you can expect your Nikon D800 camera returned to you in about five (5) to six (6) business days after our receipt. Thank you for being a valued Nikon DSLR camera owner and participating in Nikons Free Maintenance Service Initiative. 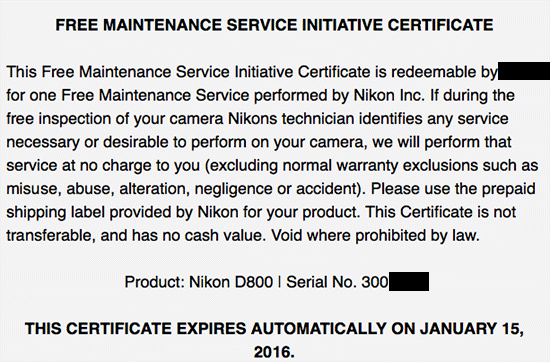 This Free Maintenance Service Initiative Certificate is redeemable by xxxx for one Free Maintenance Service performed by Nikon Inc. If during the free inspection of your camera Nikons technician identifies any service necessary or desirable to perform on your camera, we will perform that service at no charge to you (excluding normal warranty exclusions such as misuse, abuse, alteration, negligence or accident). Please use the prepaid shipping label provided by Nikon for your product. This Certificate is not transferable, and has no cash value. Void where prohibited by law. THIS CERTIFICATE EXPIRES AUTOMATICALLY ON JANUARY 15, 2016. This entry was posted in Nikon D800 and tagged Nikon D800 left focusing issue, Nikon free maintenance service initiative. Bookmark the permalink. Trackbacks are closed, but you can post a comment.